A powerful, revealing anthology of dark fiction and poetry by Black women writers. The tales of what scares, threatens and shocks them will enlighten and entertain you. Sycorax’s Daughters’ stories and poems delve into demons and shape shifters from Carole McDonnell’s “How to Speak to the Bogeyman” and Sheree Renée Thomas’ “Tree of the Forest Seven Bells Turns the World Round Midnight” to far future offerings from Kiini Ibura Salaam’s “The Malady of Need”, Valjeanne Jeffers’ steampunk female detective in “Mona Livelong: Paranormal Detective II” and others. These thought-provoking twenty-eight stories and fourteen poems cover creatures imagined— vampires, ghosts, and mermaids, as well as the unexpected price paid by women struggling for freedom and validation in the past—slavery to science-fiction futures with transhumans and alternate realities. Leave the lights on and join these amazing authors as they share their unique vision of fear. 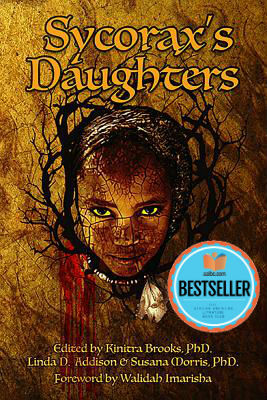 Tell us what do you think about Sycorax’s Daughters.